Last night I had a nightmare, but it was different in one important way. In most distressing dreams, you find yourself in a tough situation and whatever the problem persuing you, it usually grows worse and worse till you wake up in a cold sweat. But as I say, this one was different. In the dream, my wife (Shioe) and I had just checked into a hotel. Apparently we had decided to live in this place fulltime (it’s a dream, okay), and there I was in the bedroom. Shioe had stepped out on business, and I was alone in this new place. It wasn’t long before I noticed several large bugs crawling around. I tried to get rid of them, but the harder I tried, the more of them came out. Soon they were everywhere – spiders, huge bedbugs and ticks, centipedes, worms and quite a few things I’ve never even seen before. They were crawling all over everything, including me. I grew more and more distressed as I kept wondering how I was going to clean out these critters. At one point I thought of calling an exterminator. I looked into my wallet and saw that I didn’t have enough money for that. Oh man, what was I going to do? And it was at this point that my nightmare changed. It occurred to me, right then, that this was a hotel, and all I had to do was go downstairs and ask the desk clerk to have the room fumigated. So that’s exactly what I did — walked downstairs in complete calm and turned the problem over to the person who could take care of it for me. Usually when you have a nightmare, it leaves you feeling drained and down, as though you’ve just been defeated somehow. This time I woke up feeling boyant. And once awake, I realized that the dream was a wonderful metaphor telling me that nobody has to solve all their endless daily problems through their own conscious effort. And we’re not limited to our own resources. Instead, we can turn things over to the “person” who can handle it for us. Depending on your particular belief system, that “person” would be your subconscious, superconscious, higher self, Universe, God, Goddess, or whatever feels powerful and right to you. Now, I haven’t always regarded nightmares as helpful. That all changed one night about a year and a half ago. I had just gone to bed and dozed off. Apparently I’d already started dreaming because suddenly, I “saw” a huge centipede about 18 inches long (45 cm) (again with the centipedes) crawling across the ceiling toward me. In fact, it wasn’t crawling — it was rocketing toward me like an arrow shot. The feeling was that something utterly malevalent was coming at me with all the strength and power at its command. At that point, I sat up yelling my head off. This startled my wife because I’d never done that before. That dream really unsettled me because it had felt like something had been trying to get at me with undiluted intent. It felt the way a mad dog attack might feel. Pure threat. Naturally, I spent considerable time thinking about the dream — hah! try NOT thinking about something like that. Sometime during the next few days a novel new idea presented itself. I pushed it away again and again, but it kept nudging its way back into my thoughts. What if the “thing” trying to get at me was NOT bad? What if it was good, but my customary thinking was so rigid and biased that it “saw” the thing as harmful and bad. What if it was my biased ego trying to keep out something good, and misrepresenting its nature? The more I considered that idea, the more sense it made. Deeply distressing, but not wrong. So now, every time I have an unpleasant dream, my “normal” reaction is still discomfort and avoidance. But I make myself ignore that reaction, and instead, I hold the dream and look at it for what it may be bringing me. And believe it or not, this approach has produced dividends. Last night’s nightmare was the latest in a string of such experiences. Maybe that’s a useful maxim for examining our own dreams, too. Oh, and as a side note, now I find that the mild, non-threatening dreams, after I wake up, are the ones that unsettle me most. They have lessons, too, but a different kind. About a month ago I dreamed that I was starting up a new business. The details have faded now, but I clearly remember that as I made decisions about how to set up my products and services, my marketing, my advertising and sales, in every case, I chose the safest way. In other words, instead of doing creative, adventurous things, I stayed squarely in the mainstream, making low-horizon decisions. I stayed squarely entrenched with all the other mediocre, ordinary businesses that won’t ever do anything special. I hadn’t stretched myself in a single area. It wasn’t till the next day, after I’d thought about that “dream business,” that I realized how cowardly and unconfident that kind of behavior is. And that’s when the real impact hit me. I’d spent a good part of the night setting up my “dream business,” but it was a nightmare dream business, the kind that’s doomed to be small and stay small — generic in every way, before it ever even gets started. So here’s the lesson from all that dream stuff. The bad dreams may be about good things that your unconscious is lying to you about, as it tries to keep out change. And the easy, non-threatening dreams — well, they may be telling you that you’re trying to play your life way too safe. nice a day , i review your blog , this a nice blog and greatly. Best for me. 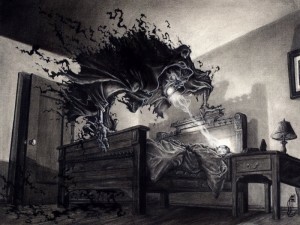 useful NightMares and Dream content. i will often to read and review your website. hello , i comment your blog , be a nice blog and perfect. Best for me. useful Astral Projection and Dreams content. i will visit to read and comment your website.